The world-famous Hermitage Museum plans to increase the number of Russian branches as the museum celebrates its 250th anniversary while the New York-based Hermitage Museum Foundation focuses on contemporary acquisitions. The State Hermitage Museum in St. Petersburg will celebrate its 250th anniversary in 2014 with galas, symposiums and events, as well as ambitious plans to open branches in several Russian cities. New satellite extensions will open in Vladivostok, Omsk, Yekaterinburg, Rostov-on-Don, and, possibly, Kaliningrad and Moscow, the deputy director of the museum's exhibitions and development, Vladimir Matveev, announced. HMF has received a number of donations for the Hermitage contemporary art collection (known as Hermitage 20/21) that the board will soon unveil. In December 2014, a Sol Lewitt installation will open in a dedicated museum room, Rodzianko said. In 2012, the museum opened a room devoted to conceptual poet Dmitry Prigov, one of 12 rooms that will be dedicated to 21st century art. However it appears that no new branches will open in the U.S. during the anniversary year. “A Hermitage branch in ‘New Amsterdam’ would be a huge boost for us to have,” Rodzianko said, referring to the possibility of a branch in New York that could emulate one that has already opened in Amsterdam. But he acknowledged that a current art embargo that exists between the U.S. and Russia would have to be lifted first. Russia began its embargo on art loans to U.S. museums in 2010, after organizations began to litigate for the return of art and archives from Russia. The HMF hopes to organize a symposium in 2014 called “Art Without Borders” in Washington, D.C. to address these challenges and concerns. It was Catherine the Great who first nurtured the Hermitage into existence with her priceless collections and patronage. Today, The State Hermitage Museum has a collection numbering about three million works - more than any viewer could see over an entire lifetime, curators like to say. The museum is housed in 10 buildings, 7 of which are monuments of Russian architecture from the 18th and 19th centuries. The well-known Winter Palace is the heart of the Hermitage. In 2005 the museum opened its first new Russian branch in Kazan. 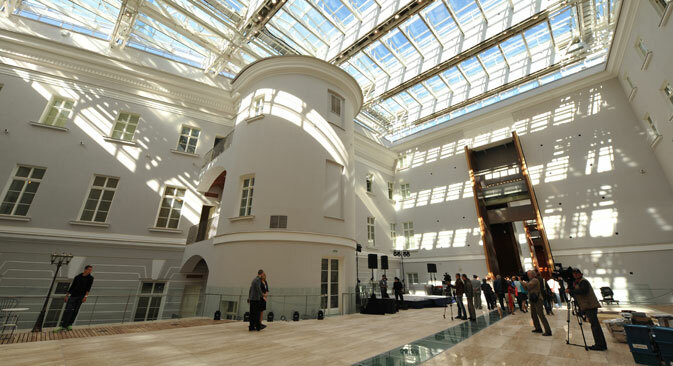 Since then, the center has held 11 exhibitions as well as regular Hermitage lectures. Hermitage-Kazan is part of the Kazan Kremlin. Why are Russian corporations collecting fine art? In 2010, the Vyborg branch of the Hermitage opened in a former art museum. Its first exhibition was devoted to the rule of Catherine the Great. Hermitage-Vyborg offers guided tours, lectures and educational programs. Meanwhile the branches are not enjoyed by the local population due to the lack of publicity. Visitors write in quest books that people are not well informed about exhibitions in the branches and there are not too many interested visitors in the provinces. Also visitors to the museums doubt the authenticity of exhibitions: "Many people ask if there is an exhibition of our copies. For some reason, there is a sense among many that the Hermitage sent here either that the Hermitage itself is not necessary, or that it is a fake ..." - said one of the employees of Hermitage-Vyborg Natalia. The Hermitage has also opened representative offices abroad. First, in 2000 at London's Somerset House "The Hermitage Rooms," and then in 2001 in Las Vegas at the Solomon R. Guggenheim Museum, but both were closed. In 2006 it was decided to establish a branch in the Italian city of Ferrara in the castle of the Dukes of D'Este to hold international conferences and restoration exchanges between the Hermitage and the National Center for the restoration of Florence. Currently there is a foreign branch of the Hermitage in Amsterdam. Hermitage Amsterdam opened in 2004 as a small annex, but following the reconstruction of the Amstelhof building in the late 2000s, the Hermitage was given a much larger space there. The museum officially opened in June 2009 with Queen Beatrix and Russian President Dmitry Medvedev in attendance. "It's a unique chance for the Dutch public to get acquainted with the collections of the Hermitage St. Petersburg,” museum director Ernst W. Veen told RBTH. “Since we started in 1991, we’ve worked together in good faith and friendship to bring exhibitions to Amsterdam…they were very successful. That was the base for a unique idea to establish in Amsterdam, the favorite city of Tsar Peter the Great, a satellite museum of the state Hermitage Museum of St. Petersburg. Since the opening in 2009 we have had over three million visitors. We are one of the most visited museums in The Netherlands. We can say a dream became reality."